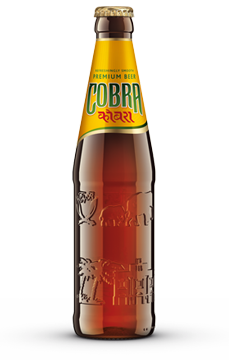 Lord Karan Bilimoria founded Cobra Beer in 1989. He launched Cobra Beer when he realised that Britain deserved a better, smoother, less gassy lager. Not just smoother, but one which complemented food, and could appeal to both ale and lager drinkers alike. Using the finest natural ingredients and a traditional Indian blend of barley malt and yeast, with maize, hops, and rice, he created an extra smooth and less gassy beer, quite unlike any other. Originally planned to be called Panther, the beer was ready to go, but the name wasn’t popular with customers and was changed to Cobra at the eleventh hour. 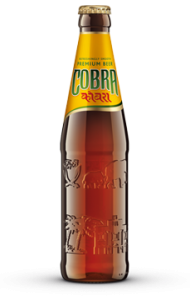 The Cobra Beer range consists of three unique beers; Cobra Premium, an extra-smooth premium beer that offers the perfect accompaniment to curry, Cobra Zero, which offers the great taste of Cobra in an alcohol-free beer and King Cobra, a double fermented Pilsner-style lager for discerning drinkers. Cobra Beers are also one of the most highly awarded. In the Monde Selection, one of the most prestigious quality awards in the world for beer, they have collectively been awarded a total of 101 Gold medals since 2001. In 2012 Cobra Beer was awarded 5 gold medals across the product range Cobra Beer (bottle and keg), King Cobra and Cobra Zero. For further information, please visit the official Cobra website here.